What do you think of when you hear the word "map"? The dictionary reveals that "map" is a noun and a verb that can be used both literally and figuratively. Scientists map genes, politicians plot a road map for peace, and business people map out a plan. People are described as being all over the map. Or, if they're successful, they're on the map. In a spiritual sense, one might map the soul. Such complexity from a simple word. Sounds like a challenge to us! What does "map" mean to you? 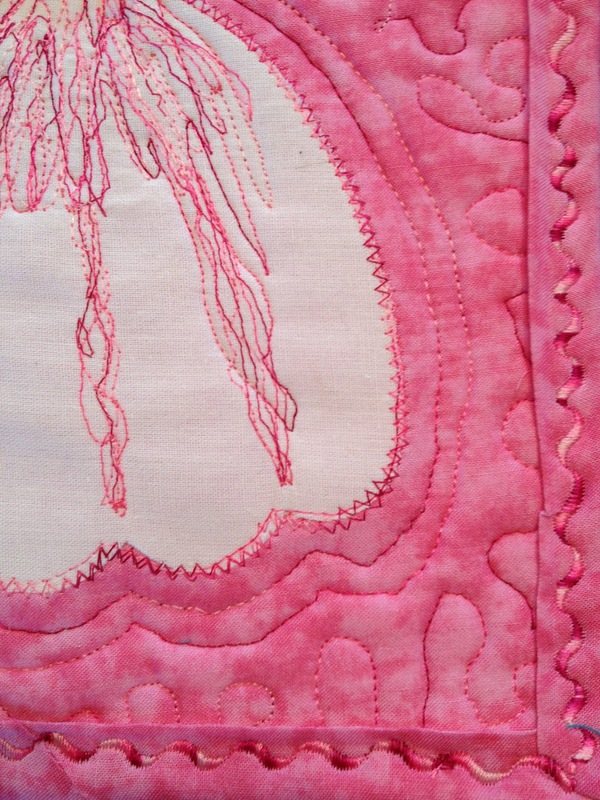 Draw us a map to your thoughts in a 10" x 12" art quilt. I was immediately intrigued by this thought and saw a map of my mind! My head is so full of so many thoughts and desires and, well, I guess just things I'm doing or want to do. 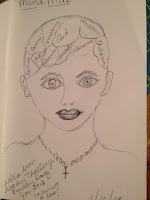 You know I love to draw my "girls" and so immediately one was in my journal with my mind mapped out. The challenge deadline was January 25 and so I've zoomed right past that, but since I can't get that sketch or thought out of my mind, I've started on this quilt process today. 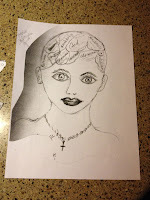 First here is my sketch, and then how I enlarged it on my copier and finally, cut out the pieces of my mind (wow, it should be so easy to control our thoughts) and next I will cut them out of different color fabrics, so I can piece them back together on the head. The next thing is the head and face. Do I get a colored fabric? Do I try to paint her on white fabric? I will probably try painting her first on white and see what happens, I can always try the other if this doesn't work. And now I just thought, paint the map! Well, it will be fun to decide just how to do this and maybe I'll even end up with two - one all painted and one in fabric pieces. Stay tuned for the next installment and see which way I choose, or if I choose! (Laughing) Following along with me, shows just how crowded my mind is and how quick I can jump around!!!! Anyway, I will post the steps as I move along and hopefully, I'll have at least one finished "map of my mind" 10 x 12 quilt sometime soon. 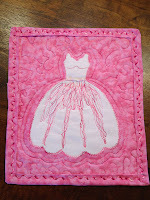 And I can't wait to see the ones submitted by the readers - they will be in the June 2013 Quilting Daily magazine! Back soon with the next step . . . . . I can't believe this is the first time I've posted since the last Project Quilting Challenge, but I don''t see anything so I guess it is. 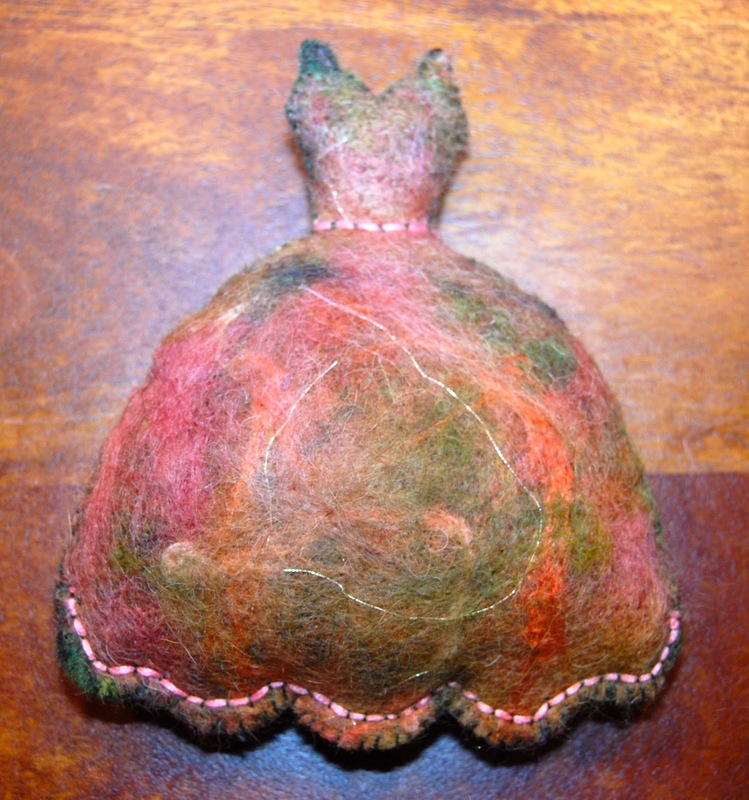 I've recently started my new blog on our alpaca adventure and so guess I've just been posting there, but I digress, let's move on to "Princess in Pink". This weeks challenge was to pick our favorite color and do a quilt, in any size or shape, in that color (and shades of it) and white! No other colors allowed. I chose pink, it actually not my favorite color, but I like it and it's how I imagined this little dress, so pink it is! We receive the challenge on Sunday. I was blank. How hard can it be to come up with a quilt of any size or shape etc. etc. It was very hard for me. As I've said my desire to quilt comes strictly from wanting to paint my flowers and then quilt them. And then my friend Sally introduced me to this quilt challenge. Actually, I really can't blame her - all she did was post on FB that she was excited about the new year of the Project Quilting Challenge and I jumped in and joined. But, I can say, if she hadn't posted, I wouldn't know about it! Thanks, Sally Keller! Which reminds me you must go look at the quilt she did for this challenge! She is just amazing and so is her quilt. So back to deciding what to do. I was so blank I decided that I just wouldn't do one. 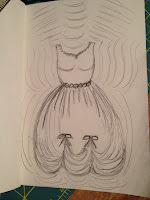 And then on Thursday as I waited at the doctor for my appointment a sketch appeared in my sketch book! The docs PA walked in and ask what I was sketching and I told her an idea for a little wall hanging. Once I said it aloud, it became real and I began to think how to do it. 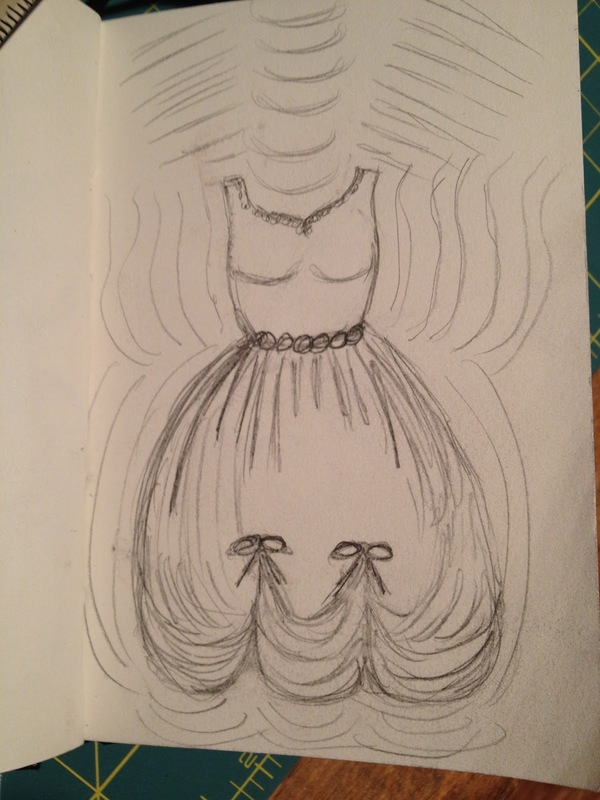 The finished item is not the sketch, but it certainly was the inspiration. This is the second time I've done a binding and I am happier with this one. I found a video on You Tube from Missouri Star Quilts on how to do a machine binding and it was really good. Finally it made sense so progress is being made. I'm not ready to begin a large quilt, not even one over 12", but we'll see what the challenge is in two weeks. You never know when they might just push me to move out of this "small" comfort zone. The one thing I hope I will do while I wait for the next challenge is practice! Practice free motion quilting and bindings! The one thing I see or hear in every class, article, video etc. is practice, practice, practice and so if I really want to learn to do this I must, you got it, practice! So until next time, I shall be at my sewing machine seeing what I can learn and, of course, preparing for Bible Study, mentoring MOPS, preparing for the arrival of the alpacas (to see more on alpacas click here) and the usual duties of homemaker! Life is good! God is GREAT! I'm so far behind! This has been a very busy week - filled with Bible Study two mornings, food pantry one morning and Association Board Meeting Thursday night - needless to say all of these also involved phone calls, study, copying, etc. etc. etc. and so it's almost time for the next challenge and I'm just posting about the last one. I mentioned in my last post about the pincushions that I had decided to join a quilt challenge and the first quilt was due in a week. Yes, we had from Sunday (I found it on Monday) when they announced the theme to the following Sunday at noon to have it completed and a picture uploaded. And now to my quilt! It begins with the word bloom - my word for 2013! So many of my friends talked about choosing their word for the year. I had never done that, but it sounded intriguing. 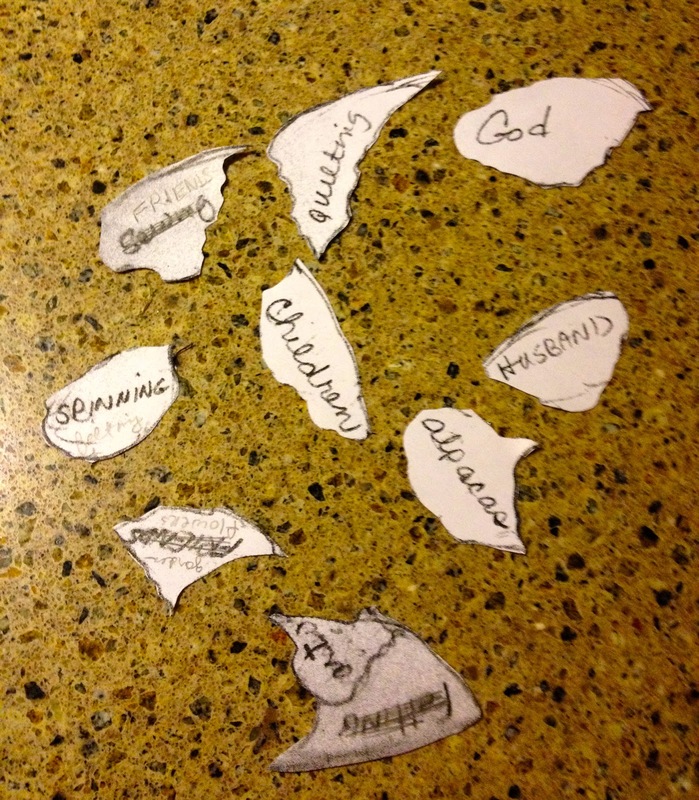 I began to pray about my word and I had two words come to mind. Try and bloom!!! The more I thought about it bloom was the word and this week I got to use it. Now, call me crazy, but I decided to give this challenge a try. I have actually quilted some fabric together in practice and about six years ago I quilted some fabric and made cute little jewelry (misc.) bags - three to be exact and a month or so ago I made a mug rug for Bill, but turned the fabric - did NOT put on binding. That I had never, ever done! So you ask, "What was I thinking?" Believe me by Saturday (a week ago) I was asking that, too! I sat down and painted a flower early in the week, as soon as I signed up. That's the easy part, I do that all of the time. In fact, that's why I bought my new machine, to make wall hangings or other small items using my painted flowers. But a completed wall hanging in a week? Oh, my goodness! But sometimes, this is just what I need, a challenge! I am a procrastinator even about things I want to do and so a timed challenge is very, very good for me! It forces me to act! Now you notice, I said I found the challenge on Monday and I painted the flower immediately and then you might notice I mentioned Saturday as the day I was asking myself what I had gotten myself into. Procrastination at its best! Yes, indeed, I thought about it every day, I looked at my flower every day and then on Saturday I panicked, went up stairs to the studio and seriously picked out fabric. No I hadn't even picked out fabric when I painted my flower! The advantage to being a fabric hoarder is that you have almost every color stuck away somewhere and so I pulled out a drawer and there it was the exact colors that were in my flower. By the way, I thanked God for this and saw it as a miracle, since it was a set of matching fabrics and was in the first drawer I opened! Next it was cutting and pinning and quilting and BINDING! Yes, I did just scream the word binding. I studied videos and dvds and my binding finally got done around midnight! Far, far from perfect, but done! I posted the picture on Flicker and connected them to the challenge and I took a deep breath and went to bed! From a distance this looks pretty cute and I got some wonderful comments, but I know that if I want to do better I have to practice, practice, practice! 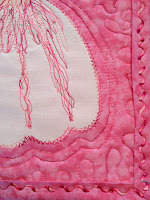 And so, in just an hour or so another challenge will appear on Facebook from Project Quilting and I will try again. Just hoping it's not so far beyond my skills that I can't do it. But whatever it is, I will try! Check it out you might want to join me in this venture. Oh, I almost forgot to tell you I won a prize! No, not for my quilting, but a random drawing of all the entries and I won a wonderful prize, picked out just for me from Pam Geisel For Quilts Sake. Check out her Etsy shop here. And now I wait for the new challenge and head out to help my sweet hubby build the stall for our alpacas, Pancho, Lefty and Sammy who are arriving soon! We went to visit them yesterday and they showed off some of their halter skills (not much yet) and let us pet them, a little. Can't wait for them to arrive, but more on that later. Well, two pincushions down and what fun I've had! I've learned new stitches, practiced old ones and learned why my mom always told me I needed a thimble! The first one is a bird (Sizzix die) and is nothing like the vintage one I showed a few days ago, but I think it's darn cute. 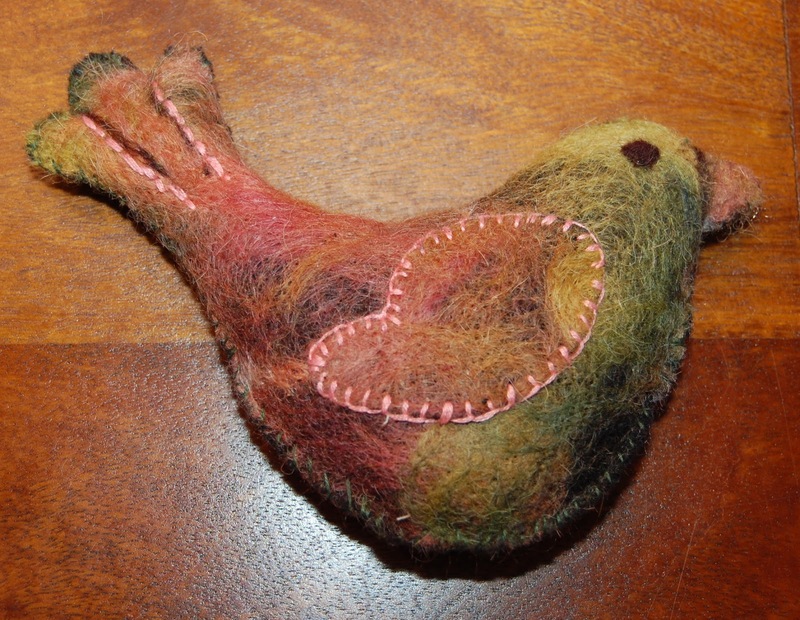 I love how this felting turned out - colors are just great and makes for a very interesting bird! There will never be another one exactly like it, but I'm sure there will be more pincushion birds. The copy of the vintage one is on hold for a while, I have much to figure out on it before I could do a copy justice. The second one is a little dress, this die is from Sizzix too, and I think it will make many cute things through the years. My original plan for this die was a quilted wall hanging and there will still be one, but I think this is real cute too. Had to laugh, three months ago I didn't even know what couching was and now it's on my dress! 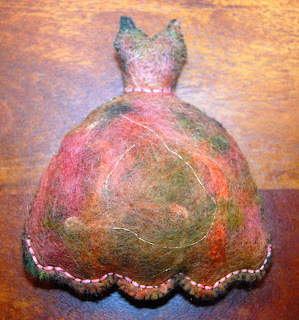 This is the other end of my piece of needle felted wool, but the colors are so different. I have enough left to maybe make a flower pin, so I have to make some more before my next project. I just signed up to do a quilt challenge, so don't know when the next pincushions will show up, but they're quick and fun, so they will appear. I must do some more needle felting and cut out some new designs - some cute ones to follow soon! But now to the quilt challenge. Check it out, you might want to join in. I've finally got my act together and have about 30 stamp sets on Etsy! I have around 100 more to add, but it is one set at a time and I'm excited that I've done this much. I've, also, already had a few sales and that is encouraging! Whoopee! These are all Stampin' Up stamp sets going back to 2006 through 2012 - currently they're all retired sets as I am still officially a SU Demo. However, I am in pending status, so that means that if I don't have sales of $300 really quick, I will no longer be a Demo. I probably will be placing a small order for some papers within the next week, so if you have anything you need, please send me a message and I'll add an order for you and it will be the last. I know I've hinted at this before, but this time I really have to let it go! They are fabulous stamps and the paper is the best, but I've just changed interests and headed off in so many directions, I just can't focus on stamp clubs and parties. I've got lots of retired papers, ink pads and inks and those need to be listed too! Oh my, so much to do and so little time! As more and more paint, fabric and fibers move in the more stamps have to move out, so check out my shop and let me know if you have a special stamp, paper color or ink you're looking for - bet it's here! Or if you need a current product before next Friday, January 11, let me know! I will do a random drawing for this Polka Dot Punches stamp set on Monday - 1/7 - if you want the chance to win leave a comment on this post and you just might be the lucky one! Reminder this set matches four of the SU punches. The Beginnings . . . .
Well, my first bird is cut out! I used my pretty felt for the top and look how the beak shows up. I can't believe it - just laid it down and punched it out! Some things just happen and it's so great when they do. I used some thick black felt for the back, but I'm far from joining the parts together. I quickly learned I had completed the easy part, now it was time to struggle a little! I made a few little stitches along the tail to give it definition and then I began the stitches along the wing. I put stitches in and took stitches out. I looked at my old bird and studied the type of stitches. 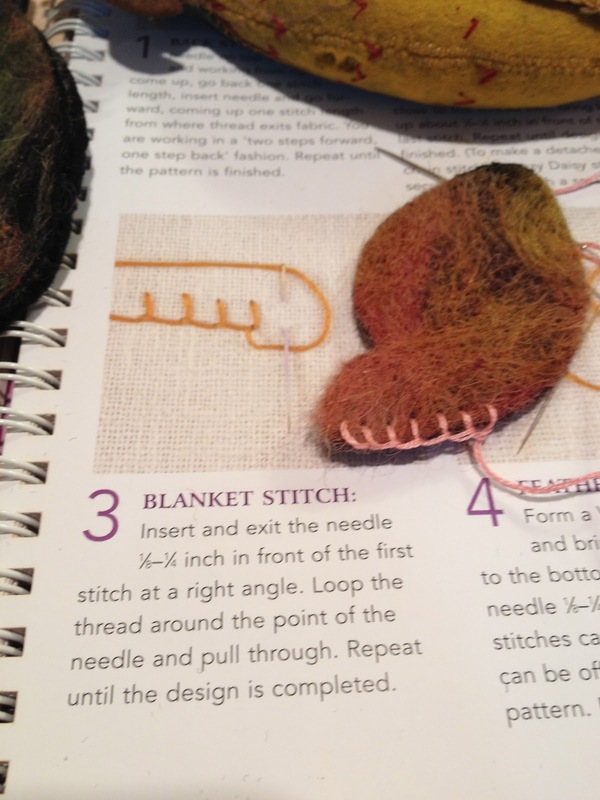 I pulled out my book, "Fabric Embellishing - The basics and beyond" by Liz Kettle, Ruth Chandler, Heather Thomas and Lauren Vlcek and found the section on hand stitches! If you like to do hand stitching and embellishing, it is a must have, check it out. Anyway, I identified the stitch as a blanket stitch and began! Then I began again and again. 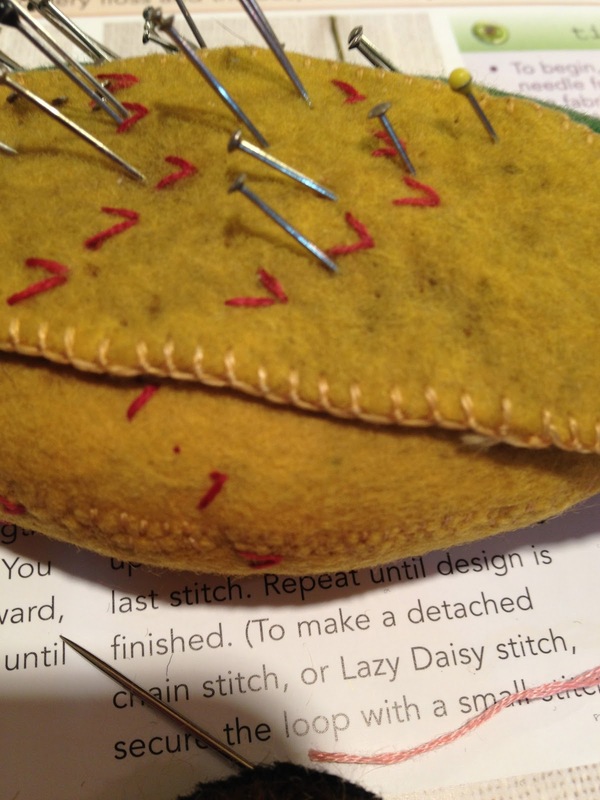 I have an appreciation for the stitching on the old pincushion that I did not have before tonight! I now have about six stitches in and shut it down for the night! After all tomorrow is another day! I am just amazed! The stitches on the parrot's wing are soooooo tiny and so exactly spaced! Mine are neither tiny or exactly spaced! I have to laugh at myself and my comments in last nights post! 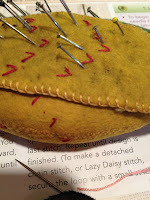 I may eventually make a similar pincushion to the original parrot, but I won't ever think it will be easy or fast! Just making the pattern will not be as easy as I thought last night. And make enough to give away, well that may be a totally different story! For now I will practice my stitches on this first bird and probably a number of others and just see what happens. Thanks to Liz and Ruth for their help - couldn't even think about doing this without them! I'll be back when I've done a little more (praying it becomes easier), so until then happy creating!